After coaching one of my teenagers on the causes of the First World War, I realize I have to start at the very beginning. Aero did not start out as a chocolate bar. Like most things English, the invented word was given a Latin root, and all things to do with the new ships of the air became aeronautical. It's starts in Valencia, Spain. Actually, it starts much earlier, I just don't know where and exactly when. Or it could start much later--last year at the home of my good friend Eduardo. He is a former toy buyer and collector of many things--some of which I'll never understand--and he tells many good stories. While we're looking at a train layout that will never get built and going through boxes of past deals and enthusiasms for art, books, lamps, cameras, toys, I see the box lid with its illustrations of attacking aircraft. Instant alert as you would expect if you recall my interest in and articles on Meccano Aeroplanes. I know this is very dear to Eduardo's Spanish roots, his toy collecting heart etc. etc. but I also firmly believe that it's only a matter of time before I get the story and the game! The story first. Valencia and the Spanish Civil War. Wherein the incumbent Spanish Republican government, backed by the Soviets, and some of the democracies, mostly individuals and intelligentsia who came to be labeled premature anti-fascists amongst other things, fought against and lost to the armies of Generalissimo Francisco Franco, backed by the active involvement of the armed forces of Italy and Germany. It's certainly impossible to deliver a potted history of this or any other war or to easily determine the rights and the wrongs. I've always had an interest in the Spanish Civil War possibly from reading Mine Were of Trouble by Peter Kemp who was an English volunteer for Franco. There were a number of Canadian connections to this conflict. The MacKenzie-Papineau Batt-alion was a volunteer force that fought for the Republican side. Hugh Garner, who wrote Cabbagetown amongst other works, was a Mac-Pap. Norman Bethune worked as a doctor for the Republicans and developed the first field blood transfusion units there. It was a war that consumed Spain but somehow Franco avoided involvement in the far greater destruction of the Second World War. It was a conflict that produced the indelible imagery of Picasso's Guernica and the timeless writing of Hemingway's For Whom The Bell Tolls. It also served as a proving ground for the Luftwaffe. The Condor Legion provided German pilots and aircraft support to Franco and enabled Goering's air forces to train pilots and perfect air power strategies including the blitzkrieg, dive-bombing and saturation bombing of civilian targets. Enough of the History Channel--this game carries so much of this history with it. It was found in Valencia. There were some abandoned contents of a house that had been condemned and was about to be pulled down by the contractor. Eduardo went with a friend to see if they could tackle the job but from his description of the creaky walls and missing floors in the five story house, it didn't sound like it would need much to come crashing down. So no hope for the piano still on one floor, or the room full of abandoned typewriters—a repair shop no more. However, one apartment, which had been the residence of an army officer, still had a cupboard or two accessible. 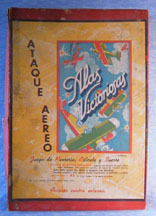 And the top of one of those cupboards yielded this very interesting Ataque Aereo game. It took me some effort to pry it away from Eduardo but I hope he eventually thought that it would be safe on my hands (or I just wore him out). Maybe it is a very rare toy (especially since it is a game with many small pieces) that should in fact go to a Spanish museum. Toy collectors like to dream of the possibilities. It may end up there yet. I have to find out more about the maker--there is a reference to Nueva Balear, Palma in small letters on the box--and a pictograph of a wise man riding a camel on the game target board. A label on the box bottom has a manufacturer's stamp from Palma de Mallorca, the name Juguettes Xafmas (or stylized Palmas?). And another label reference to Ataque Aereo Numero 4 Ref 19/B. I have to date the game--it's unlikely to have been made during the war itself, but quite likely to have been made anywhere from 1939 to 1955 or so. This was a period when Franco ruled with an iron hand and perhaps some form of rationing--one stamp looks like some form of consumer goods Permission number--was required. The game itself is a strategy game where the player has to determine the bomb aim and number required to destroy the aviacion enemigo. The same concept as any number of current computer games but here you have to fly the toy Heinkels and pull a wire to release the brass bombs. At first it is hard to tell what pieces should be there as there are more holes on the tie card than your average Meccano box but some detective work finds hand lettering on the box bottom. Someone, possibly the original owner, has listed 4 'Aviones Grandes', 21 'Aviones Peauenos' and 16 'Bombas'. The ‘aviones grandes' are Heinkel bombers with a wingspan just under four inches, and all four are there. The Condor Legion flew He-111s and Junkers Ju-52s. These toy planes have the twin rudders of a Dornier like the Do-17 so who knows exactly what the ‘big aeroplanes' are supposed to be. They are solid lead castings with original camouflage paint and squadron markings; 1E K1 through 4E K4. They each have a longitudinal hole drilled for a wire bomb release crossing four bomb bays. The 'aviones peauenos', the target aircraft, have one inch wingspans and just over half of these are there--eight of the red single engine and four of the blue twin engine monoplanes. The twin engines are probably meant to be Mosquitos, flown by the badly over-matched Republican air force. Mosquitos were built during WW2 in great numbers in Canada, partly because of their wooden construction and were invaluable as trainers and spotters. 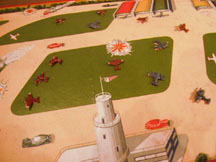 These models were scattered over an aerodrome pictured on the game board. There are target outlines for 20 altogether. I know you hear this all the time, but I can honestly say that I have NEVER seen this game or ANY reference to this game in all the books, magazines, catalogues, or auction listings. Thanks to Eduardo, this bit of history was rescued from that demolition in Valencia. Also thanks to Eduardo, I think I have most of the provenance for this game. I do not have the precise date of manufacture. I do not have the name of that army captain. I can't know for certain that he was the original owner. Another toy collector fantasy--that this was a strategy game used in pilot training by Franco's air force--shades of the rare camouflaged Dinky Toys supposedly used for war gaming by the South African Army! It seems that pursuit games, also called race games, date back to medieval times. One of the earliest published might have been The Game of The Goose with various origins claimed--either Germany in 1471 or Florence in 1587. According to R.C. Bell in Board and Table Games from Many Civilizations, it was a spiral game that reached its height in popularity during the 1700s (particularly in France). All will be familiar with Snakes and Ladders, a race game popularized in Victorian times. This game may have originated in India as Moksha-Patamu, a Hindu game of morality with the bases of the ladders coming from squares representing various types of good and the more numerous snakes coming from squares representing various forms of evil. According to The Online Guide to Traditional Games, Snake and Ladders was first published in England in 1892 and featured Victorian ideals. "Penitence, Thrift and Industry elevated a player up a ladder to squares labeled Grace, Fulfillment and Success while Indolence, Indulgence and Disobedience slid a player down to Poverty Illness and Disgrace". Pretty much what happens in any form of board game with a pattern to follow, reward and penalty squares, and dice or a spinner to decide moves. Unlike the Spanish Ataque Aereo game there are few elaborate playing pieces in a race game. The player markers can be anything from pegs to diecast top hats to miniature yachts and are a collecting category in themselves. ( Does this explain why so many board games have lost all their pieces? ). But there is usually no physical dexterity (such as aiming) required. Just the throw of the dice and the luck of the draw. But as our governments have discovered this combination can be addictive, lucrative, and instructional! Commercially manufactured board games, primarily race games such as Monopoly , Trivial Pursuit, Ludo, remained popular through most of the 20th century and are collectable today for their history and their art. Spears Games--you'll quite often find their ‘Blow Football ‘game--basically 2 straws, a plastic soccer ball, and 2 goalies for either end of the dining room table--great fun and every English family must have had a set! Start again, I got lost there. 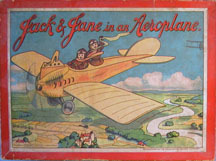 Spears Games made this very early race game; Jack & Jane in an Aeroplane. Every time I look at it, I see something new. It was manufactured in Bavaria and the box lid shows a low wing monoplane with a biplane in the background flying over the English countryside- although the castle looks Bavarian! The game board shows a spiral shape (just like the original Game of the Goose) and 50 squares. Each square has a consequence--in one flying too low gets you caught in the branches and you start again. The illustrations show pre First World War parasol (wire supported like an umbrella) monoplanes and an airship, but this may be a 1920s version of an older game. One square shows a parachute. If you land there your aeroplane catches fire and you are out of the game--but you save yourself. The clothing styles look more like Our Gang, and the box top doesn't show the older style wire frame for the wings that is a feature of Jack & Jane's aeroplane on the game board. Typical cost savings--use the artwork again but update it slightly--just look at Meccano instruction books over 50 years. Jumping some 20 years and landing in the 1930s is this game A Journey By Air. Also Spears but this time marked Made in England and Manufactured at the Spear Works, Enfield (memories of a leaky Royal Enfield motorcycle), England. Maybe this is to offset the Germanic look of the 1930s airliner--surely Junkers--on the box top, and on the very red black and yellow game board. This is another spiral pursuit game with lots of illustrations of air travel just before the Second World War. Both these Spears games have the same theme--the ups and downs of the new era of air travel-- and both have wonderful graphics. Remember the moral overtones in the Victorian editions of Snakes and Ladders? Here is a pursuit game with a similar instructional purpose. Approved by Canada's WW1 air hero Air Marshal WA Bishop V C, D S O, M C, D F C, invented and designed by F/L O. Cathcart Jones R C A F, entire royalties donated to R C A F Benevolent Fund, approved by The Air Council, manufactured by The Copp Clark Co. Toronto in 1941. 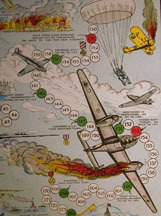 The game board is a long haul, 175 places, with many wins such as 'good solo flight, go on to 40', ‘good formation flying', shot down Messerschmitt' and equally many losses such as 'put shots through tail, lose one turn', 'shot down over England, bailed out', 'lost in London night club, lose one turn'. This is a great piece of history. The game board shows the long training process required to become a pilot officer. This at a time when Canada's contribution was huge. The British Commonwealth Air Training Plan had been developed from nothing. In his 1984 book The Plan, James N. Williams writes: 'Very few pilots in the RCAF in the spring of 1939 had even come close to a modern front line fighter. Fewer still had ever flown anything that even faintly resembled one.' Initially with lukewarm support from Mackenzie King and the Canadian government, The Plan ended up turning out 137,738 pilots, navigators, bombers, and ground staff for the allies. This is also is also an interesting piece of communication to the general public (propaganda if you're on the other side). 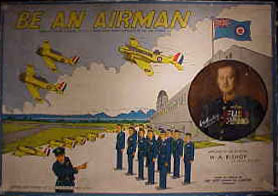 Be An Airman illustrates the risks and rewards; 'Awarded D.F.C. go on to 141' Awarded VC take another turn' necessary to achieve final victory at square 175 the END. ‘Back in Canada a National Hero'.